One of the best photoshopped cards of the set, Umbu Paw features a background from two cards - the branch and the top half of the background is from the Guardian picture that is in the banner of all pages. The lower half of the background is from a Bograth image by Holmberg. 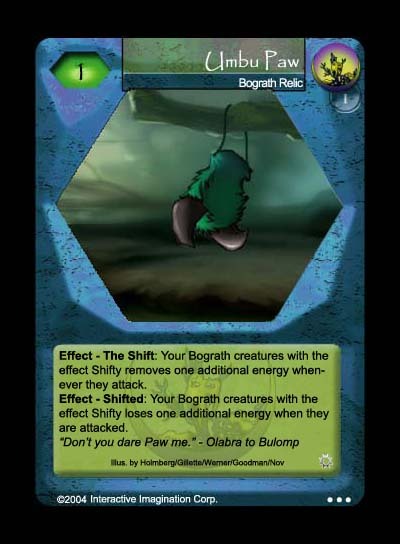 The paw itself is from the Bograth card Umbu. The only thing that I drew in was the string that connects the paw to the branches. The card, like all the other Bograth cards in this set is based on Shifty Creatures, and this relic encourages Bograth shifty creatures to attack - the downside is that it causes more damage to Shifty creatures when attacked. Playtesting has shown this to be a very powerful card when used properly, but one that hurts the player if played during the wrong time.